In a number of mainly riverside and coastal areas around Britain, the more extreme weather occurrences of the last few years have caused land erosion at an alarming rate. Widespread damage to property and localized environmental disasters are becoming more prevalent. This has long been the case with erosion off the East Coast and now a potential environmental catastrophe is being caused by the inaction of Authorities in North Devon. Early in January 2018, Storm Eleanor ripped 50 ft of land from behind the eighth tee at the Oldest Golf Links in England, Royal North Devon Golf Club in Westward Ho!, which occupies land adjacent to the Northam Burrows. The eighth tee marker now lies on the beach, and the seventh tee is just 49ft off the shoreline. Boulders washed up under the force of the storm from the historic Pebble Ridge at North Burrows now lie strewn across areas of the low lying links course. 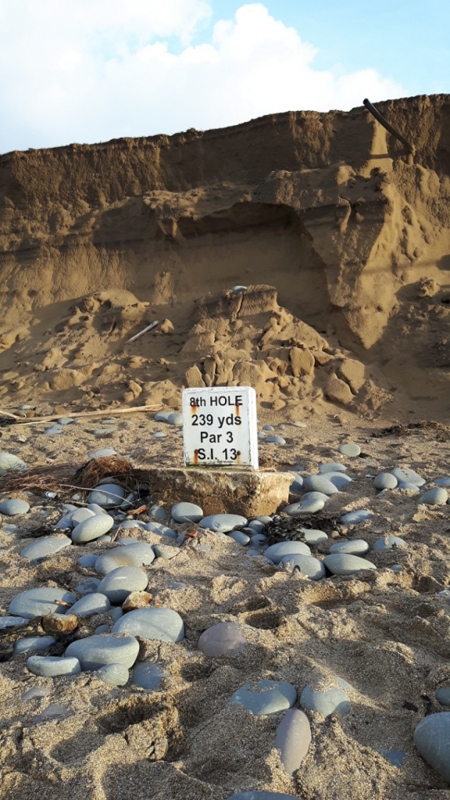 Dependent on wind conditions, it is thought that the high tides expected in February could cause further significant damage to the golf links and further expose the landfill site. Between 1935 and 1995, part of the land alongside the 154-year old golf links was used as a landfill tip, which is now at risk. The entire Northam Burrows area, including the land on which the golf links are built, is designated as a Site of Specific Scientific Interest and form an integral part of the designated United Nations Biosphere Reserve. Should further erosion take place, the beautiful Estuary of the Taw and Torridge, and the holiday beaches of Westward Ho!, Saunton, Croyde and Woolacombe, will all suffer. The two-mile long Pebble Ridge at Northam Burrows is a natural formation that protects the low lying land ground behind it. It has remained intact while naturally receding over time at a rate of around 1.5 metres annually, but has now all but disappeared, after a succession of violent storms. The Royal North Devon Golf Club has permission to build two new greens but, if it does so, must relinquish two existing ones within three years. However, the loss of the golf links is not the only issue at stake. Natural England’s inertia will lead to an environmental disaster for the area. One local land use specialist stated: “It’s as though the authorities think that it is out of sight covered with sand, so it is not an urgent problem. With the speed of erosion, however, an environmental disaster is inevitable unless action is taken in the very near future.